Bouchér Photography: The Knot recognizes Boucher as one of San Diego's Highest rated photographers for their "Best of Weddings 2007" Nationwide Bridal Magazine! The Knot recognizes Boucher as one of San Diego's Highest rated photographers for their "Best of Weddings 2007" Nationwide Bridal Magazine! We couldn't of been more excited to hear the news that we were selected/voted for The Knot's Nationwide "Best of Weddings 2007". We immediately had to get a copy of the magazine to see it for ourselves ;). It's a huge blessing for us being that The Knot is a household name in our industry. While out of all of San Diego's Photographers, from what we understand we were one of a mere 11 chosen based on the highest votes! In defense of other photographers we personally admire and know out there; there is a select few that I felt deserved to be on that list as well; but I'm not complaining ;p.
"These amazing photographers will probably be one of your favorite vendors with their attention to detail and skill at capturing the intimate, special moments that no one else can. "You deserve the best! The Knot Best of Weddings is a coast-to-coast guide to the country's top florists, venues, photographers, cakes, and everything in between. 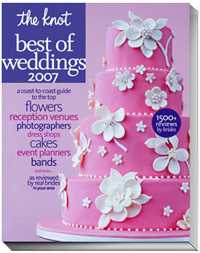 Bursting at the seams with hundreds of beautiful photos, real-world advice, top 10 lists, and planning tips, The Knot Best of Weddings is a must-have magazine for any bride-to-be that knows only the best will do. 300 pages. Published by The Knot Inc."
Damn! You guys are being recognized like crazy! WPPI, the knot, collages. Keep them coming.